Best boat for this motor? This is a 1985 30hp Johnson short shaft that is currently on my TNT. I am going to build either a Flying Saucer or Zip to put this motor on. I prefer the Zip but don’t want to go that route if it is going to be under powered. What do you all think? What kind of top end would this provide on each boat with 2 average adults on board? I'd put that on a Zip in a heartbeat. Plenty of people have had good luck with 30hp motors on the Zip. Joshua Burks recently completed his Zip and got good performance out of a 2-stroke 25hp. Look for his videos on YouTube. You'll be glad you did. Of course, you could also build a stretched Flying Saucer or a shortened Zip at 13 feet. That might get you a little extra performance. Just keep in mind that, as far as "performance" goes, the Zip is really a 2-person boat with a back seat. 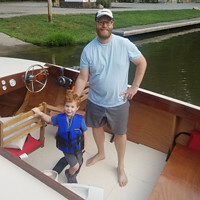 I am running a 97 merc 25hp two stroke on my Zip and have been very impressed with performance, maiden voyage was myself and three kids, our combined passenger weight was 540lbs. It planed with ease and topped out at 26 mph with flat water and no wind, below is a link to my video, if you skip to 4 minutes from the end you can see the performance for yourself, either boat would do well with your 30hp. The weight of the Flying Saucer is listed as 190lbs and the Zip is 375lbs. I wonder why the Zip is almost twice the weight and is only 2’ longer? Doug G wrote: The weight of the Flying Saucer is listed as 190lbs and the Zip is 375lbs. I wonder why the Zip is almost twice the weight and is only 2’ longer? I don't think the bare hull of the Zip is anywhere near 375 lbs. When we completed the bare hull--fully decked and painted, but no seats, etc.--two of us were able to lift it onto the trailer bunks with no trouble. Our best guess had its weight somewhere between 225--250 "el-bees." Regarding motors, our tired 40-horse Mark 55 Merc gives us 30 MPH with a 10"-pitch prop, but this motor was built when horsepower was taken from the crank and not the prop. The newer, 30-horse Johnson should give decent performance if the boat is kept light and you keep your passenger load in the front seat. We've had four carbon-based life forms in our Zip, with two in the back, and the boat was reluctant to plane. More importantly, there was very little freeboard left at the transom. Squeezing those bodies into the front seat improved performance dramatically, so load distribution is as critical as horsepower. My ZIP was likely a little lighter than most, a tad under 800 lbs. fully loaded for a days outing, not counting people. My engine was a Mark35A, 35 HP @ the crank, ergo closer to 30 HP at the prop in today's power measurement. I could run 29-30 MPH with 2 people on board. Thank You everyone for the replies. I have decided I will build the Zip and if I am not happy with the 30hp that can be upgraded anytime. The dreaming has already started! Can't wait to get started! Josh put a 25 on his zip and he seems more than pleased with the performance. It is apparently a particularly strong running 25 Mercury from the late 90's I believe.